As the final whistle sounded at Ewood Park, a collective sigh could be heard from Liverpool supporters all over the world, as United clinched their 19th league title, eclipsing their Merseyside rivals’ haul of 18. And after the agony of losing by a point to Chelsea last season, we finally got back what we have always termed as “our” title. Of course, no team has a divine right to the league title, but given United’s dominance in the league since it started, it can be forgiven if some of us think that the rightful place for the Premier League trophy every season should be at Old Trafford. It was hard to envision this happening 25 years ago when Sir Alex Ferguson arrived during a period when Liverpool were the dominant force. They say that whoever wins at the end of 38 league games will be the best team, and undoubtedly, the Red Devils are fully deserved winners. This United side certainly does not remind us of the class of ’99, nor does it have any special standout players like the Ronaldo-led team, but they have certainly dug deep when required this season, and produced the goods when it mattered most. The stirring comeback wins at West Ham and Blackpool were added to a long list of memorable victories, and our brilliant home record of 49 points out of a possible 51 helped to make up for a rather awful away record, and ultimately win a league which was much more competitive than usual (no teams have been relegated yet despite there being only two matches left) this year. More than ever, I believe this league win was a really tremendous team effort. The players who’ve had to step in have done well. Berbatov led the line with aplomb for the first half of the season when Rooney was injured, Hernandez had a brilliant debut season, Rooney hit form towards the latter part of the campaign. Smalling looks like a future England centreback when he slotted in, so much so that it is hard to believe that he was playing non-league football just two seasons ago. Nani really matured this term, adding a devastating end product to his bag of tricks and leading the league’s assist charts. The Da Silva brothers have shown what good prospects they are for the future, while the likes of Gibson, Evans and Anderson have also played their parts when required. Carrick recovered from an poor run of form to put in superb displays, most notably against Chelsea in the Champions League. Of course, Van der Sar and Vidic have been the ever-present stalwarts in the side, lending a consistency to the team, while the ageless Giggs and Scholes chipped in with their experience and know-how. Four titles in the last five years. What a superb achievement. The mastermind behind this league success, and countless other honors in the past, Sir Alex Ferguson, has achieved his goal. The man is incredible; for building side after title-winning side, for his seemingly insatiable appetite for trophies, for evolving his management style with the times and yet still having a firm handle on the dressing room. As I said last week, all United supporters have to thank him more than ever for the team’s success. And the wily old fox will surely soon be plotting for title number 20 next season, after the more immediate task of attempting to beat Barcelona in the Champions League final. You told us to come back when we had 18. Well, now we have one more than that. 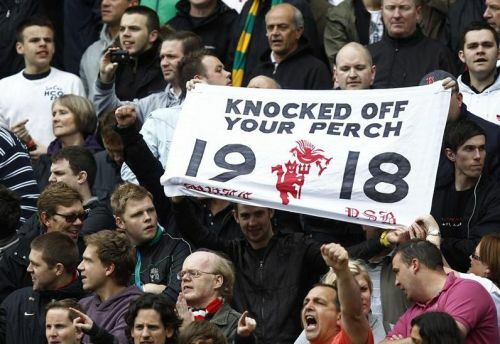 Liverpool, you’ve been knocked well and truly off your perch. This entry was posted in Match Reports and tagged Bel19ve, Blackburn, Champions, Manchester United. Bookmark the permalink.